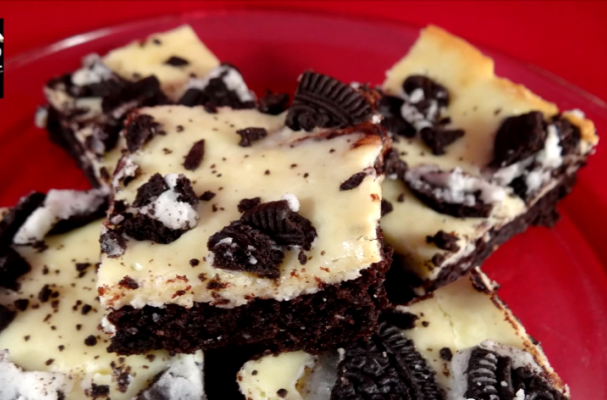 Cookies and cream brownies brings this classic American dessert to the next level. Homemade brownie batter is layered with a luxurious cream cheese filling that is studded with crushed sandwich cookies (likes Oreos). The marbled effect of the two layers not only mixes the two flavors but also creates a beautiful (and appetizing) brownie. If you want to double the amount of cookies in your dessert, you can hide the sandwich cookies in the brownie batter as well. Be sure to enjoy these decadent brownies with a tall glass of cold milk.